A conversation between Matt Bell of The Collagist and Nate Pritts of H_NGM_N. Matt Bell is the author of How They Were Found, a collection of fiction from Keyhole Press. His fiction has appeared recently in Conjunctions, Unsaid, and Ninth Letter, and has been anthologized in Best American Mystery Stories 2010 and Best American Fantasy 2. 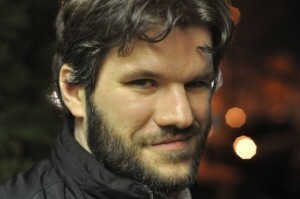 He is also the editor of The Collagist and can be found online at www.mdbell.com. Nate Pritts is the author of four full-length books of poems – most recently Big Bright Sun (BlazeVOX) & The Wonderfull Yeare (Cooper Dillon Books). His fifth book, Sweet Nothing, is forthcoming from Lowbrow Press in late 2011. 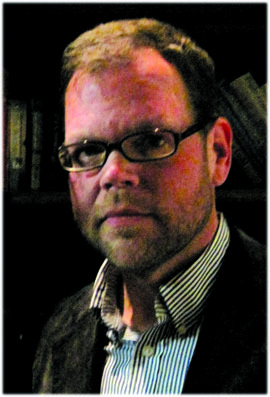 He is the founder & principal editor of H_NGM_N & H_NGM_N BKS & can be found online at www.natepritts.com. MB: I was thinking about some of the parallels between The Collagist and H_NGM_N, and thought maybe we could start by establishing some common ground. For instance, we’ve both got magazine names that look harder to say than they are: People have trouble pronouncing The Collagist for some reason, and I’ll bet the look of H_NGM_N throws a lot of people off when they talk to you about it in person. We’ve also published a lot of the same writers, reviewed some of the same books, and probably generally attract similar readers, although my guess is that you attract a poetry-leaning audience and we attract one that’s a little more prose-focused, even though we both publish across all genres. Here’s at least one difference: While The Collagist sprung out of the book publishing efforts of Dzanc Books, H_NGM_N started as an online journal and then became a book press. So let’s talk about that transition. Was publishing books always part of your plan, or was it something that came up later in the evolution of the journal? How has the addition of the book publishing arm changed the magazine? NP: Publishing books is a natural extension of what I set out to do with H_NGM_N but it wasn’t always part of the plan. H_NGM_N was, for the first two issues, a mimeographed magazine that I made myself. I moved online with #3, partly because I was interested in presenting a wider range of content (the artist portfolios, comics, a higher “page count” per issue) but really because I was interested in exploring the possibilities of reaching a broader audience. Not just more people, but different kinds of people (I’ve become a nut for segmentation & click-through totals & only half jokingly refer to myself as H_NGM_N’s UX/analytics evangelist!). From there, whatever history or track record the journal has springs from constant & obsessive rethinking about how best to put good writing in front of people. We’ve put out single-author chapbooks, flip/chapbooks with two authors, a subsidiary single-author ‘zine (COMBATIVES), & now pdf chapbooks & full-length titles. Not part of any plan in a strategic sense. I have a lot more I could say about our development & the stutter steps we’ve made & our cockamamie schemes over the years but a lot of the rationale for what we’ve done comes back to this – Because I wanted to & because I thought it would work. The guidelines printed in our first issue state that H_NGM_N “will print anything the Editor likes” (a line I stole from Ted Berrigan). I don’t want to deflect the last part of your question (how has publishing books changed the mag; answer: drastically, substantially, & also not at all) or gloss over something you said that really intrigues me (that, probably despite our best efforts, our respective mags are pigeonholed as either prose or poetry-leaning) but here’s where I’m going with this: H_NGM_N, despite having been around for years now, to me still feels like an indie effort – with all the fierce vitality of spirit, in-the-moment adaptability & lack of resources that implies. But The Collagist seems like part of the establishment already (at just over a year old! Congrats!). It started with serious intentions, with a clear sense of what it was & what it intended to be. Though I’d love to see your corporate structure (! ), I guess I’m asking for just a little peek behind the scenes: how much control do you as editor have over The Collagist? Are there certain parameters laid down that you have to follow? Do you see your mission as inextricable from the Dzanc brand? H_NGM_N, for all its messiness, reflects my tastes & sensibilities & best thinking on how to establish & expand a community for literature. It is me. Is The Collagist Matt Bell? MB: I like you and Berrigan’s “will print anything the editor likes” line a lot, but then what editor wouldn’t? I do have full editorial control over The Collagist: Dan Wickett and Steven Gillis at Dzanc have never asked me not to publish something I wanted to, and actually generally don’t see any of the work as it goes through the editing process unless I pass something along to them for a second opinion, which doesn’t really happen too often. They asked me to start the magazine with them because they believed in my editorial abilities and taste, and thankfully they’ve given me the freedom to do the job I wanted to do. I think that, like you, I tend to make decisions primarily based on what I like, first, and also what I think fits the body of work The Collagist is accumulating: I think one of the benefits a literary magazine can bestow upon the larger literary scene is to put like-minded writers and readers in conversation with each other, just by place them in close proximity, and I hope The Collagist has done that to some extent. The biggest cue I’ve taken from the Dzanc brand is that part of the overall mission of the organization is to publish work that might not easily find a home with more traditional or commercial presses. At The Collagist, that means not just looking for work that’s accomplished and strong, but also work whose strength comes at least in part by the difference it contains, the new ground its seeking apart from the prevailing literature that surrounds it. We get a lot of very strong submissions, but it’s the ones with the biggest ambition that I respond to the most: I want work that takes real risks, not just in its choice of subject matter but with every single sentence. That’s the work I want to publish, and the writers I like to work with. I’m generally a fairly hands-on editor, and can be even more so, for the right piece: I’m willing to take something that has huge ambition that still has some rough edges and work with the writer, but I’m rarely interested in a perfectly polished story that does nothing new. There are so many people now who can writes “good” short stories. I want to publish work that goes for more. What’s your editorial philosophy on working with writers? Do you edit work that you’ve accepted heavily, or is mostly just copyediting? That sounds a little reductive, so let me ask it a different way: How much of what’s in the final issue is a result of you and the writer working together, either before or after acceptance? How do you see your role in relation to the work you accept, once the curatorial role of accepting or rejecting submissions is over? NP: Putting “like-minded writers and readers in conversation” is a great way of describing what my favorite literary magazines have always done. It’s about context in some ways, about making sure that you’re putting the work in front of people who will appreciate it while simultaneously pushing that border a little bit to keep expanding the audience. To describe a little bit of the behind the scenes process first – I read every submission that comes in to H_NGM_N. Then I parcel them out in targeted packets to my associate editors – Clay Matthews, Darcie Dennigan & Robert Krut – who read through their allotted submissions & let me know their thoughts. Most typically, I’ll make an accept or reject decision at that time, though there are exceptions – work might get accepted or rejected after my initial screening read; work might be sent to multiple associate editors to generate deeper dialogue. It does happen that I’ll make suggestions on revisions for a poem. It’s rare, however, & I think the reason it’s rare speaks to our crucial inner fusion core. Which is to say, H_NGM_N has a clearly defined aesthetic, or is at least in the process of constantly demonstrating & recalibrating that aesthetic through the work we publish. So if a poem finds itself standing in the target area of the types of necessary utterances we seek to support, or if it enlarges that previously defined space, it comes from the poem’s intrinsic nature, its soul, & not from its word choice. So basically, a poem is either in or it’s out. I have occasionally written back to an author with a comment or suggestion but I always make it clear that I am accepting the poem whether or not they implement my advice – or even listen to me at all. My own process of revision doesn’t typically expand or improve upon an existing poem; through revision I create entirely new poems. All of this, however, is only one of many (as you put it) curatorial roles. I’ll put aside the important aspects of promotion & marketing for a minute to keep focusing on content. One thing I’ve said often enough that I stopped questioning it is that I publish poets, not poems (or “writers, not writing”). What the hell does that even mean? Actually, it’s not true, but it gets close to my thinking. I don’t want to publish one poem by a poet who will then go on their merry way, away from the community of writers H_NGM_N seeks to foster. I would like to help show the world what some particular writers are doing because I believe in their art as much as I believe in my own. But my belief isn’t IN one poem, though it may start to flare & burn after reading one poem. I don’t want this interview to take a discouraging turn, but this seems as good a place as any to mention that we get thousands of submissions each year. We have to turn a lot of stuff away. Being online, I guess I could publish 2000 poems per issue if I wanted to, at no increase in production expense. But would anybody read them all? Over the past ten years I’ve been constantly thinking & rethinking how best to present the writing I care about to an audience that will then care about it as I do. Hence the recitation of endeavors I mentioned earlier. We’ve just added the book publishing arm & so far I’m happy with how that is furthering our mission, though I’m always trying to dream up new ways to front good work. Will the monthly issues of The Collagist continue indefinitely? Even though you’re a part of the Dzanc mothership, with all of its myriad efforts, do you foresee any other permutations of the empire that will spring from, & be uniquely of, The Collagist? The online arena is vast, challenging, & evolving constantly. What other ways are there for engaging literature to take it over? MB: Before answering your excellent question, I wanted to back up to highlight something you said: “So basically, a poem is either in or it’s out. I have occasionally written back to an author with a comment or suggestion but I always make it clear that I am accepting the poem whether or not they implement my advice – or even listen to me at all.” This is how it is for me too, if I didn’t say so above, although I’m more like your prose editor, spending more time actually editing the work itself. I have never, ever taken a story on the basis of whether or not a writer takes my edits. I always take the story first, knowing that I will be happy to have it even if it doesn’t change, and then after acceptance offering my suggestions. To make an acceptance contingent on whether or not the writer takes all of my edits is to put them in an uncomfortable place, where they might have to choose between their art and the publication, and I’m never going to do that to a writer. Going back in the direction of your new question, I think it’s worth mentioning that we could publish a lot more work than we do too. But as you said, who would read it? I think it’s better to have a tighter-focus, and to publish a smaller number of works. Over the course of the year, we publish a lot of people (48 fiction writers, 48 poets, 12-24 essayists, 12-36 novelists, and maybe 50 book reviewers), but in any given month there’s only maybe thirteen or fourteen pieces. It’s possible to read one of our issues beginning to end. That’s really important to me, although given the nature of reading online, there probably isn’t anyone who does it. In my opinion, it also raises the value of the individual story or poem or essay or book review, because they don’t get lost in a pile of names. As far as whether the monthly issues of The Collagist will continue indefinitely: I’d love to keep doing it at this pace, as long as I can. It’d be hard to stop, in some ways: I’m three issues out right now, and if I switched to quarterly, I’d be done with 2011’s issues completely. Unless, of course, I changed what the magazine was at the same time. And who knows. Maybe that will happen. The biggest reason to stay monthly is for the novel excerpts and book reviews, which work best when timely. I like the constant engagement of it as well. I’m not sure in which ways The Collagist will keep merging and moving forward the main Dzanc brand, but I’m sure new opportunities will keep developing. We just announced a chapbook contest run through The Collagist but published by Dzanc, and so will be directly picking a manuscript to be published by them later this year. And because we publish more genres than Dzanc itself generally does, we decided to open it across genre lines, which means that we might be selecting the first poetry collection or non-fiction manuscript that Dzanc publishes. That’s an exciting chance all by itself, and something I’m incredibly glad to have happening this year. As for the future of the online space, it’s really hard to say. I was on the phone with another interviewer yesterday, talking about right issues as they relate to online magazines and eBooks, and I told her that I think these issues are getting muddied all over again, because what it means to be “in print” is in a state of flux it’s never really been in since the printing press. Computers and eBook readers and other mobile devices are increasingly becoming a part of our daily reading practices, and that’s only going to increase as time goes on. I don’t think the printed book or magazine is doomed by any means, but there’s no doubt that these other ways of reading are going to take up a larger amount of our time and attention. Thankfully, the technological stuff is just something to stay aware of, and to move into when the time feels right. The biggest way for our magazines—and the writers we publish—to keep growing their audiences is to keep doing what we’re already doing: Looking for great writing, presenting it well, and telling everyone we can about it. The growth is in that kind of greatness, far more than it is any particular technology. While we’re talking technology and growth, here’s a question for you: Do you do readings for H_NGM_N, either online or in person? What do you do at bookfairs like AWP, or other similar events? That’s been one of the biggest questions for me this past year and a half, in trying to figure out how best to take what we do online and then promote and share in the physical world. NP: I think there are lots of things we do to promote our journals that we’re not even aware of. Every time I see a Matt Bell tweet or Facebook status update, or story online somewhere (either the full story or just your name in a table of contents) it reminds me of The Collagist, it reminds me of Dzanc & it reminds me of your books through Keyhole. Which I guess is my way of saying that since an editor can, in some cases, be closely associated with a journal, that editor’s personal activity ends up being a kind of outreach (this interview is another example!). If our journals are brands, then we’ve become identified with those brands, & so in some ways we are the most important touchpoints for it – one of the myriad ways people interact with the brand on a daily basis. From this online reach, comes a real world payoff. Your question is specifically asking “how best to take what we do online and then promote and share in the physical world” & I’m sort of responding by saying that I think those things are inextricably the same whole, as opposed to two things that need to have some kind of arrow pointing between them. But: you know that, of course. And, of course, it’s super important to be actively engaged with a face-to-face community through events. I’ll start by saying that I don’t have a single answer for this; as I’ve hinted, most things about H_NGM_N are an endless improvisation – I’m constantly coming up with new ideas, discarding old ones, watching the new ideas turn into old ideas, etc. I do think it’s important to have a presence at AWP, or other bookfairs & events. Last year, we also set up a table at both the CUNY Chapbook Festival & the Juniper Fest that UMass, Amherst runs. Having a reasonable & aggressive event schedule is fun & exciting – & of course it gives you the opportunity to hawk your wares a bit. We try to stay visible! One year, when I couldn’t be at AWP, Eric Appleby (my undercover webmaster & one of the guys behind Forklift, Ohio) did some brief video interviews & live vid-blogging from AWP that we posted online; last year, we assembled a gigantic framework of PVC pipe around our table (a table we split with Forklift & Typecast Publishing). We want to have fun, to generate something interesting around our presence – but we never want to do anything predictable, just as a blatant empty attention grab. It’s all fueled by an authentic drive to connect. I’m certainly no brainiac when it comes to this. ANY of this. I think I’ve done a good job of adapting to the online world, & finding ways to extend that reach. But I’ll close my answer to this question in the same way I probably could have answered any of these questions: I’m trying to contribute to this vital ongoing conversation we are having about what constitutes contemporary literature. I take the responsibility incredibly seriously, I try to be active in my program, & I’m trying to have fun while doing it, cycling through a relentlessly inventive & ever-changing curriculum circus designed to give people a reason to actually read something that might change their life in some way. MB: “It’s all fueled by an authentic drive to connect.” That’s the secret, I think, more than anything else. The secret to what? Probably everything we’ve been talking about. The kind of submissions that succeed, the kind of writers we want to work with, the reasoning behind the kind of publications we’re producing. It’s easy as a writer—and as a reader—to feel like you’re howling into the void, but I’ve come to know that there are always people out there listening, and when people are doing genuinely honest, great work, they almost always eventually get heard. I’m happy to do my part at The Collagist to make some small number of great voices a little louder, however I can, as often as possible. As you said, it’s a big responsibility, but it’s one I feel privileged to have the chance to take on, and that I’m trying my best to fulfill.